My first hair trial with another artist went poorly - it looked like I had helmet/prom hair. That's when I restarted my search and found Candace. I had a trial at her salon in Roxbury. I showed Candace photos of my bad trial and also styles that I was liking. I wanted something soft and romantic, but still with a lot of detail/braids. Candace took what I showed her and interpreted it beautifully. During my trial we worked together to make minor tweaks as we went, and ended up with something perfect. Candace is super easy to work with and incredibly sweet. On my wedding day we made some very minor changes from the trial and she nailed it again. Having Candace doing all of my bridesmaids hair and helping us get ready on the day was wonderful, calming, and super sweet. not only did she work quickly, everyone loved their hair. She even worked braid wonders on my bridesmaid who has hair nearly down to her waist. Also, I was so sure of Candace's skill and overall demeanor after my trial that when another friend was looking for a hair artist upstate - I immediately recommended Candace before my wedding day. I can't recommend her enough. I loved my hair, and my girls loved theirs too! Candace is so sweet and great at styling different types of hair. She was also flexible with adding another friend to get her hair done. Jit was very sweet too, and has a good eye for colors when it comes to makeup. It's nice to have someone so calm and professional on the most stressful day of your life! My experience with Candace was amazing. She has lots of experience, but does not force any opinions on you. She works really fast, so during my hour long hair trial, we were able to toy with 4 very different styles that helped guide me towards what I wanted for the actual wedding day. Then, once the wedding day came, she was punctual, calm, and really made me feel like I could trust her. My bridal party and mom looked beautiful. Finally, I did NOT stop dancing at the wedding and my hair stayed perfectly in place. 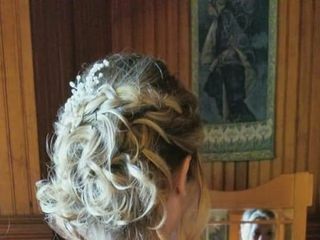 I would highly recommend Candace to anyone wanting to get their hair done for any special event. She's great. Candace was incredibly professional and easy to work with. Her work was beautiful and her creativity was inspiring for my daughters farm wedding. Highly recommend! Candace was nothing but accommodating. She came right to my house on time and created masterpieces on my sister’s and my head! I received comments all night long on my hair during my wedding. She’s sweet and so easy to communicate with. I would highly recommend her for your special occasion! Candace was GREAT!! She was easy to work with, great prices and flexible the day of the wedding when we added another person. She is efficient, FAST, and open to changes. My hair and my bridesmaids all looked wonderful for the big day. Thank you Candace!!!! Candace did my hair for my wedding this past weekend, along with my mother in law, my mother, my sister in law and two bridesmaids. She did an awesome job on all of us!! She is professional and punctual, all while radiating this laidback, calm vibe through the whole process. She even helped me relax when dealing with an issue with my wedding (not hair related). She does amazing work and everyone was very happy with their look! I would definitely recommend Candace to anyone and she is the master of all braids!! Thanks so much Candace it was an absolute pleasure working with you from day one up until my big day! Candace was amazing on my wedding day! She made sure everyone was completely happy with their hair fixing stray hairs throughout the morning as needed. She also captured my vision and added some flowers last minute that wasn't even in the plan but became one of my favorite parts of the day! Very professional and warm to help ease wedding day jitters! I highly recommend Candace! Candace was the absolute best. 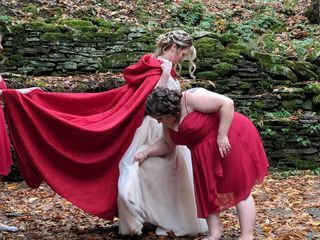 She did 4 of our hair for my wedding day, and was the perfect person for it. She exudes calm, positive energy, which certainly helped my nerves in getting ready. She worked quickly, but ensured that everyone was completely happy with their hair. I loved how she did mine - she has a great eye for non-traditional hairstyles. And it lasted for the entire (long!) night, despite lots of dancing! 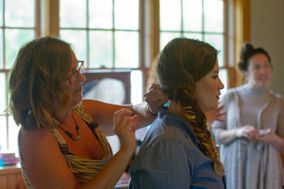 I would HIGHLY recommend Candace as a hair stylist for any Catskills wedding. Candace did my, my mother's and my bridesmaid's hair the morning of my wedding and she was a dream to work with! During my trial she understood exactly what I was looking for and executed to a T! I wanted simple but elegant and she talked me through a bunch of different options until we centered on one concept! She made me and my fellow bridesmaids feel like princesses and I have never seen my mom's hair look so great. She even accommodated a bridesmaid who opted in at the last minute! She works quick - which is amazing and the results do not suffer a bit! She is a master with fishtail braids! We had a great time the day of, chatting and laughing -she is also a very fun person to talk to while getting ready for such a momentous occasion! Thanks Candace! I would 100% recommend! My whole life is basically one extended bad hair day but Candace Rudd of Twisted Sister Salon managed to take my unruly, frizzy mop and give this Mother of the Bride an updo that didn't quit even after dancing in the summer heat. I received compliments on my hair all day long. Candace is lovely to work with, knows what she is doing, makes you feel very comfortable, works quickly, and wants the customer to be happy with the result. She also did the hair for my daughter and 4 of her bridesmaids, all of whom looked smashing for this big day. I recommend Candace with confidence that she will come through for you just as she did for us. Gosh, where do I begin... Candace was absolutely amazing to work with. I live in California and flew across the country 2 days before my wedding day. 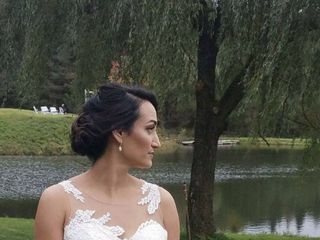 Candace was able to create a hairstyle for me on wedding day better then I could have even imagined, no trial and just showing her 2 pics right before sitting in the chair. She banged out 10 beautiful hairstyles all by herself for me, my bridesmaids, moms, grandma, and flower girls, her timing was amazing. She gave us the best experience for getting ready the morning of. She laughed with us, was apart of conversations with us, gave advice, it actually felt like she was one of us. You won’t be disappointed, I’m so glad I had the opportunity to meet Candace as she definitely contributed to making my day super special. Candace was wonderful and easy to work with! She spent time with me at my trial until we got the right look and was very excited about doing something different. She was great on the day of the wedding! I felt absolutely beautiful and my hair didn't move an inch. I'm so happy I selected Twisted Sister Salon to take care of my girls, family and myself on my wedding day. Candace was professional and so very easy going. She has a great eye! I highly recommend Candace to anyone for their special day!! She will make you feel at ease and does beautiful work! Candace is amazing! She understood the look I was going for, and was a pleasure to work with. She arrived on time, and her calm and professional manner put everyone at ease and helped the day run smoothly. I highly recommend her. 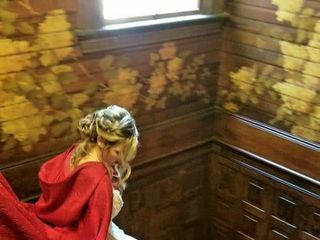 Candace was amazing and did an incredible job on my hair for my wedding day. She also did my sisters and three of my friends which all looked amazing. We all couldn't have been happier with the results! Highly recommend Candace! Candace and Jit are AMAZING! Candace created the most beautiful design for my hair. 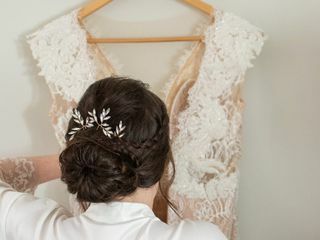 Our wedding was a Victorian-inspired garden party theme and Candace made the most beautiful braid with a soft front twist for the perfect Victorian touch...and, of course, with flowers woven into the braid! It was PERFECT! Jit did my make-up and she struck the perfect balance of enhancing my natural features so that I felt like the most beautiful version of myself on my wedding day. Both ladies are so sweet, kind, and talented. I can't recommend them enough!! Candace is amazing!! She did hair for me and all of my bridal party for my wedding this past month. Candace did a wonderful job styling my hair -- she perfectly created the look I had envisioned for myself and made me look and feel beautiful! I highly recommend hiring Candace for your wedding day. Candace was great to work with. 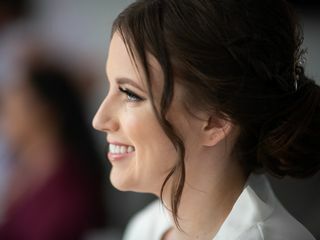 She made us all beautiful for my daughter Ashley’s wedding on May 5, 2018. This was our second time working with her as she also did my other daughters Michelle wedding June 18, 2016. You will not be sorry if you choose to work with her. She is awesome! Candace was wonderful to have style my and my bridesmaid's hair on the wedding day! When I had a trial with her, she was super flexible and down for any style. She gave each of my bridesmaids a totally unique look and incorporated a hair wreath I'd brought into my updo perfectly. She also has a sweet, fun personality that was awesome to have in the getting ready room! She was great! Candace was so wonderful! I absolutely adored how my hair turned out and it stayed the entire night! Candace listened to all of my ideas and worked her magic. She was lovely to talk to as well. I would highly recommend seeking her out for your own big day! Candace is absolutely amazing!! She was so incredibly easy to work and had such a calming presence the day of the wedding! My hair was perfect and she creates the best braids. She even introduced me to my make-up artist for the wedding! Highly recommend working with her and hope to use her again in the future! Candace is an absolute rock star! 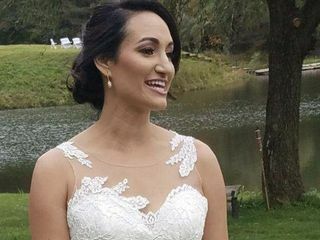 She was very easy to communicate with leading up to the wedding, confident in her abilities to replicate the photos I sent, and came to my wedding fully prepared and in great spirits. I wasn't 100% sure what I wanted to do on the day of, so we talked it through and she created a masterpiece that I got compliments on for days, and that I am still getting complimented on in photos a month later. She is super affordable, very sweet, flexible, and awesome at what she does. She even stuck around after doing my mom's hair and mine because some of my friends needed a little extra help with theirs. I couldn't recommend her more. Candace is great at what she does and so easy to work with! During my hair trial she really listened to me and was totally receptive to my ideas. We tried several things before we settled on something I liked and then she was able to recreate that look on my wedding day, as well as do the hair of 6 of my other family members. Everyone was very happy with her work - I recommend her highly!